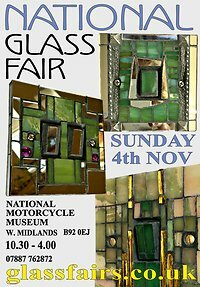 Specialist Glass Fairs' flagship event, the National Glass Fair, will take place on Sunday 4th November at the National Motorcycle Museum, West Midlands B92 0EJ. This twice-yearly fair is eagerly awaited by the glass-collecting fraternity because of the wide variety and quality of the glass offered for sale. A specialist event like this is a great opportunity for enthusiasts to meet other like-minded individuals and to browse the spectacular array of exciting pieces on sale, plus there is always the possibility of finding a bargain - or haggling your way to one! Exhibitors are drawn from across the UK and sometimes from further afield and always bring their very best stock to this event, so it really is a fascinating experience to visit one of these fairs and, if it is your first time, we can guarantee that you will not be disappointed. Contemporary studio glass is a big collecting area and is well represented at the fair by a number of glass artists using various techniques such as graal, cameo engraving and blown work , and there will be some new faces and old friends at this event. If you are more interested in antique and collectable glass, such as Georgian, Victorian, Art Nouveau or Art Deco, then our many specialist dealers will be sure to have something to inspire you. Alternatively, collectors of twentieth century glass, paperweights and jewellery will be spoilt for choice. Come along and see for yourself; you'll have a great day out! Open from 10.30am until 4.00pm, admission is £5. Refreshments are available and there is free parking.